The all-new 2014 Mazda Mazda6 is pulling off a first-ever for the Japanese automaker and will do it in New York’s famed Time Square. The all-new 2014 Mazda Mazda6 has made its debut around the globe, but its never reached the height’s that it’s about to reach. Mazda has announced that the 2014 Mazda6 will be the first-ever to have a billboard advertisement in New York’s famed Times Square. The new Mazda6 will get plenty of attention as it will be seen by more than 117 million people. The world will be watching as the 16,000-plus square-foot billboard can be seen as the ball drops on New Year’s Eve. The 2014 Mazda6 will be a significant feature of the celebratory festivities at One Times Square. Mazda will show a combination of running and still images of the all-new vehicle that started on December 19, 2012, and running until March 31, 2013. Mazda will certainly get there money’s worth as it will be prominently displayed above Time Square. What better way to introduce the all-new 2014 model than to display it high above the biggest U.S. city. Mazda is counting on the Mazda6 Time Square advertising to propel the company to new sales heights. The new Mazda6 (known as the Atenza in Japan), is the flagship model of a whole new generation of vehicles that Mazda will be bringing to production in the future. Mazda is hoping the new ad will help improve their brand image around the world. In a recent speech, Takashi Yamanouchi said “Let's all work together to promote the new Mazda6, to make it a model that gains the support of customers all over the world and leads the Mazda brand to new level." Mazda is hoping the new Times Square ad will get the world's attention on Mazda and it’s newest product. The first-ever SKYACTIV-D-diesel in the U.S. 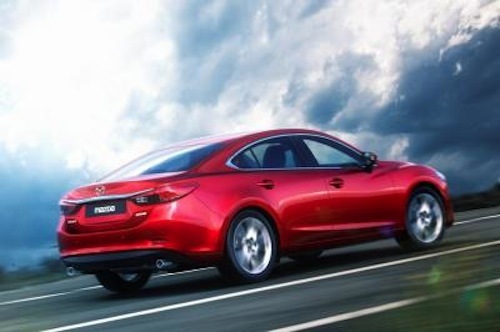 The new 2014 Mazda6 will feature a fuel-efficient SKYACTIV-G 2.5 direct injection gasoline engine. But the big news is, the first-ever SKYACTIV-D-diesel equipped version will be available in the U.S. during the second half of the year in the new mid-size sedan. The new SKYACTIV-D 2.2-liter clean diesel engine will achieve a low compression ratio of 14:1, and Mazda has not released performance estimes yet. The Mazda6 was introduced first in Europe and Japan and the U.S. will see the all-new Mazda6 in early 2013. The all-new 2014 Mazda6 will go on sale January 2, and will be priced from approximately $21,000 U.S.
"The new SKYACTIV-D 2.2-liter clean diesel engine will achieve a low compression ratio of 14:1, and is estimated to produce 184 horsepower and 185 lb-ft of torque." That's the hp and torque for the 2.5L gas engine, not the 2.2L diesel engine. The diesel has 147hp and 173hp versions, with the latter producing 310 lb-ft of torque. Good catch - 185 lb-ft would be a joke for a diesel that size. I wonder if this car needs urea injection as the Passat and the Touareg diesel versions? You are exactly right! Thanks for catching the mistake. Thanks for reading! Do you know if this car will have urea treatment of the exhaust? Great question! Mazda solves the cold-start inefficiency problem by recycling exhaust gases to quickly heat the combustion chambers. The engine's low NOx emissions mean it would not need expensive urea after-treatment to be 50-state legal in the U.S. Thanks for reading!